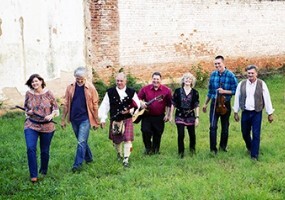 On March 17, 2018 Puddingstone will arrive at the CoMMa center to celebrate St. Paddy's Day with a mix of traditional Celtic, folk, classic, rock, blue grass, fife and drum, bag pipe music, and Irish dancers as only Puddingstone can do. The seven person musical group has been entertaining audiences for over thirty years, and is presently recording their eighth album-Puddingstone All Mixed Up! Many of the evenings songs will come from this upcoming album. So, join us at CoMMa for a splendid evening with music and dance that will tickle the fancy of everyone and put a spring in your step.